Baix Empordà County is located in the province of Girona, in northern Catalonia. This privileged location, between the sea and the mountains with the Pyrenees to the north and the Mediterranean to the east, is also less than one hour from the historic city of Girona, 100 km from Barcelona and 100 km from France. It is well connected, with the Girona airport nearby, and easily accessible by motorway, via the N-II or the AP-7 (1). This county is 701.7 km2 in size and home to 133,000 inhabitants (2). Its easily accessible location, beautiful natural setting, famous beaches of the Costa Brava, historical, monumental and cultural heritage, as well as its wide variety of cultural and musical events, festivals and many outdoor activities, in addition to its renowned cuisine, make Baix Empordà an ideal place for a holiday or to live all year round. Baix Empordà is a region full of history, culture, tradition and charm (3). It has been inhabited since prehistoric times and was also home to Roman settlements, but it was the medieval era that left the most important mark on the area’s architecture, a fact that can be seen in many of the small villages in the county. With its great artistic and cultural heritage, this county is a wonderful place to discover megaliths, in stunning natural settings like the Gavarres, l’Ardenya and Montgrí massifs, which are also home to prehistoric remains. The county is mainly flat, peppered with small hills with little villages nestled around them. These historic jewels, reminiscent of medieval times, include Pals, Monells, Peratallada and Ullastret. The region’s mountainous zone is made up of the Gavarres and Montgrí massifs. And the coast, which is the central part of the Costa Brava, is defined by marked contrasts ranging from the cliffs of Begur and l'Estartit to the sandy beaches of Gola del Ter, Palamós and Platja d'Aro, to idyllic coves like Sa Tuna, Sa Riera, Tamariu, Aiguafreda and Cala Estreta. 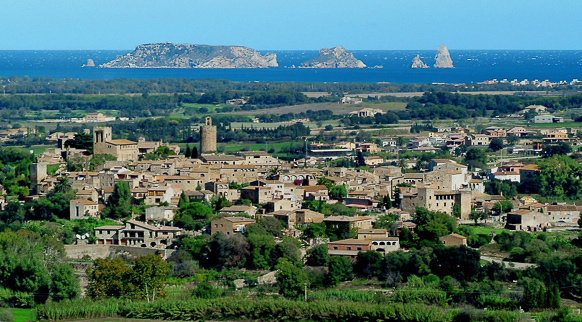 However Baix Empordà isn’t only a tourist area, its mild Mediterranean climate also makes it a great place to live (4). In this area, spring is long on the green plains, and autumn is temperate, with every tone of colour imaginable from golden ochre to garnet. The region also offers the chance to see rice paddies and wheat and sunflower fields changing with the seasons. It is a calm county perfect for enjoying day-to-day life and watching the beauty of nature unfold. Baix Empordà is known for its typical farmhouses, called masias, a sign of the region’s agricultural tradition, which still endures and is being recovered with local crops and livestock. These buildings are full of history, fully remodelled or ready for a new owner to renovate to their own taste, and are scattered throughout the rural landscape, giving it life and charm. Montgrí is a massif that, apart from its natural beauty, is part of the region’s historic and cultural heritage, with places like the Montgrí castle and prehistoric caves. The Medes Islands are a group of islets located just off the town of l’Estartit, with their own particular flora and fauna, especially underwater, which is why snorkelling and scuba diving are popular activities there, although the number of visitors per day is limited. This wetland area is made up of river deltas, marshland, estuaries and dunes that, apart from their highly varied landscapes, are rich in animal life, especially birds that find food, shelter and nesting grounds in this habitat. The highest point of the Gavarres massif is Puig d’Arques at 532 m. This area, with its coastal Mediterranean climate, features oak, pine and alder forests as well as many other plant species, like typical Mediterranean wild mushrooms. Numerous species of birds, mammals, amphibians and reptiles co-exist in harmony in these forests, which those who enjoy the most authentic natural settings love exploring. This spectacular landscape alternates between cliffs and coves, with the highest point at 518 m.: Puig de Cadiretes. Its particular geographic characteristics make it home to flora and fauna more often found in Atlantic climates. Perfect for all types of underwater activities and active tourism with its well-marked trails, this area is an extension of the Gavarres massif towards the coast, with small hills that jut out over the sea. The county’s beaches make up the central part of the Costa Brava, the most prestigious costal area in all of Catalonia. From cliffs to long sandy beaches to small rocky coves, everyone can find their ideal beach on the Costa Brava and lose themselves in the clean water ranging from blue to green in colour, with every tone of turquoise and aquamarine in between. The capital of Baix Empordà is La Bisbal de l’Empordà. Located inland, with 10,000 inhabitants, it is known as the “Ceramics Capital” for the area’s long tradition of producing a special, high-quality type of ceramics. The production of ceramic products is one of the activities that keep La Bisbal alive, both economically and culturally. This can be seen walking through the streets bursting with colourful shops, which is quite a visual experience. The Terracotta Museum gives visitors more information on this type of artisanal work and how it evolved in La Bisbal d’Empordà. The many cultural and leisure activities available in La Bisbal include watching how artisans make these ceramic items on the street each Saturday and ceramics workshops that are open to the public. The “Ceràmica de La Bisbal” brand is engraved into or marked on all local ceramic products and allows buyers to identify this special local product. It is protected by the European Union and controlled by a Regulatory Board made up of artisans and businesspeople from La Bisbal and the surrounding towns that also fall under the umbrella of this brand. The town of Pals has a medieval centre with 2,000 inhabitants located on a hill called Puig Aspre. The narrow streets still preserve the typical shape of those times, as well as their gothic structure. Both the surrounding landscape and the town’s monumental value make this a not-to-be-missed stop for a wander. Peratallada, which has been named a medieval historical/artistic area, stands out for its location on a rocky outcropping from which most of the stone to build the town was extracted. It is worth stopping by and discovering its cobblestone streets and their magic of times past. The castle is also worth visiting and the town has many restaurants serving the high-quality food the region is known for. The municipality of Palau Sator, originally founded by the Romans, is located along the right bank of the Daró River, on its rich flood plains. Palau Sator is a clear example of medieval town planning. The medieval centre of town is reached by passing through Torre de les Hores, where visitors can see the well-preserved walls and one of the towers of the castle presiding over the town. Sant Feliu de Boada is located just to the south of the municipality of Palau Sator, to which it belongs. It is reached via one of the most enchanting roads in the Baix Empordà, the one that connects Torrent and Sant Julià de Boada. The historical houses that make up this quiet, tranquil town are located along this route, surrounded by fields and the Pals wetlands. Its church, in the late gothic style, is the most emblematic building in the centre of town. Ullastret, located on a slight rise on the right bank of the Daró River, has a clearly medieval structure. It is known for the Iberian settlement at Puig de Sant Andreu, one of the most well-preserved Iberian sites in Catalonia, located on the eastern side of the town. The small, quiet municipality of Torrent is made up of a cluster of houses surrounding the parochial church of San Vicenç, which dates back to the 14th century. One of the town’s points of interest is the Sant Llop hermitage, located outside and above the town centre, with its peculiar baroque style. Located north of Palafrugell, between the Llofriuenca plain and the Les Gavarres massif, Llofriu is a medieval town known as the final resting place of writer Josep Pla and home to the family house where he spent many years of his life. Josep Pla Foundation, located in Palafrugell, organises the “Josep Pla Route in Llofriu”. Mont-ras has a population of nearly 2,000 inhabitants and a long history, starting with the Romans, which can be discovered at the museum in Palafrugell. Mentioned in texts from as early as the 10th century, this town belonged to the Viscountess of Bas from 1280 and later to the priors, until it gained its independence in 1858. Montras is located between the sea and the mountains, both of which for centuries have inspired its renowned culinary style. This exceptionally beautiful location, with the Les Gavarres massif as a backdrop, is perfect for a wide variety of hikes and active-tourism activities. The Formigues Islands, with their stories of sailors and pirates, can be seen from its virgin coast. Located in a valley, as its name indicates (it derives from the Latin for “the valley of red earth”), the municipality of Vall-llobrega uses its land for dryland farming, including crops like cereals, olive trees and grape vines. Open to the sea and sheltered by the Les Gavarres mountains, Vall-llobrega has a welcoming natural landscape and is a perfect place to live in one of the farmhouses from the 17th and 18th centuries scattered around the church, town hall and schools in the Raval de Baix area of the town centre. The municipality of Torroella de Montgrí is made up of two towns: Montgrí, inland, and L’Estartit, on the coast, with a joint total of 11,500 inhabitants. Torroella is located at the foot of the Montgrí massif (302 m.) and close to the river that breathes life into it, the Ter River. It has grown around the medieval walls, which include highlights like the Torre de les Bruixes and Portal de Santa Caterina that have been well preserved. With a pleasant climate year round, Torroella de Montgrí is a very popular place to live as it offers elegant, classy housing options that allow residents to enjoy both the sea and the mountains, only 6 km. away, in the heart of the Costa Brava, just opposite the Medes Islands. The cultural and culinary wealth of this area is clearly reflected in its well-known festivals and restaurants. History emanates from each nook and cranny of Torroella de Montgrí. It must be noted that the Montgrí massif is home to the “Cau del Duc de Torroella” cave, which was inhabited some 300,000 years ago. This municipality is made up of the three villages from which it gets its name, with the capital at Sant Sadurní, and has become one of the largest in Catalonia. Located on the left bank of the Daró River, the town of Cruïlles preserves its Romanesque tower, away from the town centre, that was originally part of the castle that has long since disappeared. Its circular base and 26-metre walls help create the skyline of Cruïlles, along with the bell tower of the Santa Eulàlia parochial church. Monells was created around the castle, of which only the walls remain. It is an enchanting town, seemingly straight out of a medieval film set, and a perfect place to get away from it all but also have everything close to hand. Monells is bisected by the Riera del Rissec. The Arcs Monells hotel is another option for accommodations in Monells, located on the Rissec River. It preserves the style and charm of the town’s traditional houses. The municipality of Foixà is made up of five historical settlements: Cuells, Sidillà, Sant Llorenç de les Arenes, la Sala and Foixà. These centres have a scattering of the typical Catalan farmhouses that are characteristic of Baix Empordà, located on rocky hills or on the flood plains of the Ter River. Reconditioned historical paths allow visitors to discover Foixà on foot or by bicycle. Baix Empordà is a great place for hiking, given its natural diversity and the work that the Baix Empordà County Council has put into renovating and marking trails in the area. The network of hiking trails (370 km.) covers the whole region, allowing visitors to discover everything from enchanted forests to beautiful coves to well-preserved medieval villages. There are 250 km of rural cycling paths that are well signposted so that cyclists can discover Baix Empordà at their own pace. You can prepare your routes using guides published by the Baix Empordà County Council or by purchasing them at active tourism establishments in the area. The special terrain of Baix Empordà attracts many MTB riders from around the world. There is an MTB Centre, with a visitors’ centre in Castell d’Aro, which offers 19 mountain-biking routes with a total of 326 km of varying levels. Baix Empordà has several marinas and maritime clubs that offer all sorts of services for the most seafaring visitors. The largest and most well-known is the commercial, fishing and marina port in Palamós. - Club Nàutic de l’Estartit (Torroella de Montgrí). Fishing and marina port. - Club Nàutic Aiguablava (Begur). Marina. - Club Nàutic Llafranc (Palafrugell). Marina. - Club Nàutic Marina de Palamós. Marina. - Club Nàutic Port d’Aro. Marina. - Port of Sant Feliu de Guíxols. Fishing and marina port. The pleasant temperatures and mild climate of Baix Empordà make it possible to play golf year round. The county has 5 golf courses and 3 pitch and putt areas, with excellent facilities and services, as well as several routes. Music festivals and local fairs. Baix Empordà features a wide and well-known range of culinary delights, with world-renowned restaurants. This region’s cooking makes art out of the best products from the sea and the mountains. Baix Empordà cuisine offers the best of the sea, with fish and seafood, delicacies from the garden and the forest, tasty meats and local rice dishes. Thus, the county’s best restaurants serve Palamós prawns, blue fish from the Costa Brava, rice from Pals and fresh locally grown vegetables straight from the garden. The area’s great chefs prepare unique dishes with products like angel-hair escarole and red-eyed beans that are indigenous to l’Empordà and have recently been reintroduced. Typical dishes include escalivada (roasted vegetables), meat-stuffed apples, fricandeau, platillo, roasts, cuttlefish with peas, suquet (fish stew), rice dishes, chicken with langoustines, creams, etc. We also recommend trying other specialties like sweet botifarra sausages, l’Empordà artisanal brunyols (fritters), curd and farmer’s cheese. Writer Josep Pla called the plain between the Montgrí and Gavarres massifs and the sea l’Empordanet. Since then, this name has taken hold and is increasingly used in the area to refer to its landscape, culture and cuisine. L’Empordanet is known for its own typical type of food.